Imbalances such as these are the precursors to the signs and symptoms by which we detect and label (diagnose) organ system disease. Improving balance – in the patient’s environmental inputs and in the body’s fundamental physiological processes – is the precursor to restoring health and it involves much more than treating the symptoms. Functional medicine is dedicated to improving the management of complex, chronic disease by intervening at multiple levels to address these core clinical imbalances and to restore each patient’s functionality and health. 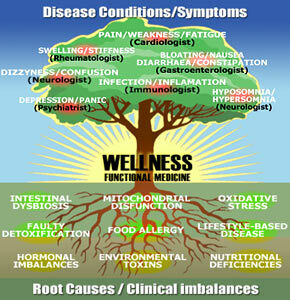 Functional medicine is not a unique and separate body of knowledge It is grounded in scientific principles and information widely available in medicine today, combining research from various disciplines into highly detailed yet clinically relevant models of disease pathogenesis and effective clinical management.